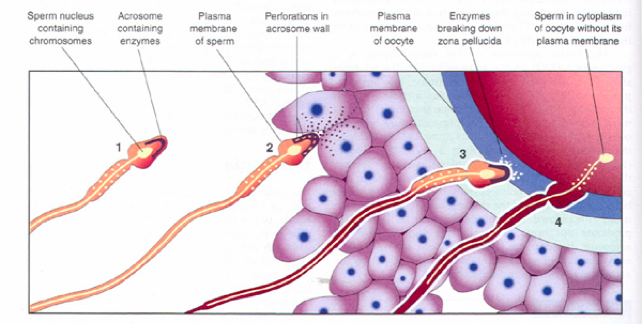 Sperm Fusion (thought to be due to fertillin on sperm cell binds to integrins on the egg) to the Egg triggers a Calcium wave (occurs within a minute upto 15-20). 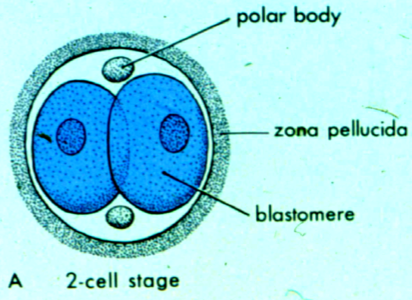 Zygote becomes 2-Cell embryo via cytokinesis. 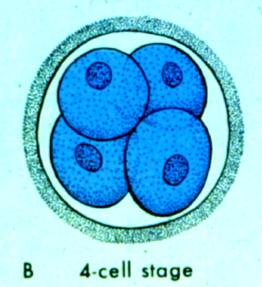 Each cell in the egg is called a blastomere. Cells are totipotent. Each blastomere divides and you get 4 total. Cells are starting to flatten on each other. BMP4 is secreted by the distal endoderm onto the endoderm and mesoderm. Noggin is able to bind up enough BMP4 to prevent growth and bud formation. But only in that one area with the white X. Leads to bud bifurcation. Happens 2^23 times. We know BMP4 begins the bud due to LacZ reporter gene staining. When you stain lung buds you only see it at the terminal ends of them. 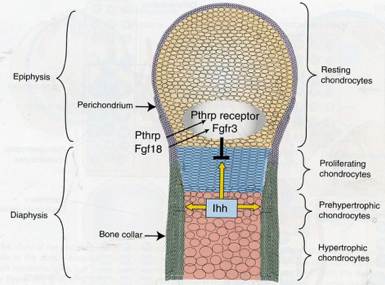 FGF10 - Maintain distal respiratory epithelia. May promote branching. These two drive lung shape. 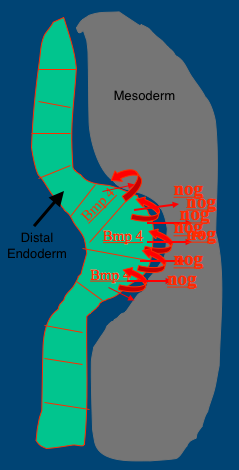 Noggin is secreted by the mesoderm surrounding the distal endoderm. It is a natural inhibitor of BMP4 by binding it (like a sponge). It does not affect the transcription of translation of BMP4. Similar processes occur for the pancreas, liver, and other organs. BMP7 is the same thing as BMP4 but BMP7 causes little proliferation in the endoderm. Is expressed in gradient fashion. 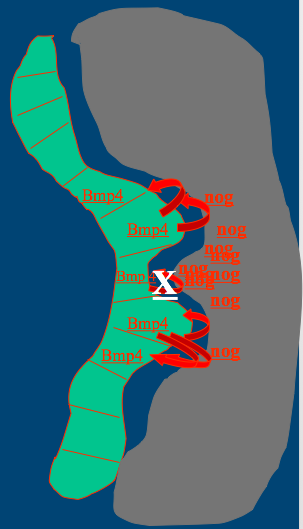 BMP7 is inhibited therefore they are no long inhibiting Ptc. Ptc is free to act. 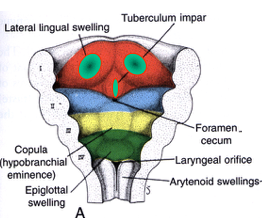 The endoderm then proliferates with the mesoderm to form the tongue. It is a natural inhibitor of BMP7 by binding it (like a sponge). It does not affect the transcription of translation of BMP47. Note: Noggin inhibits all BMPs. Noggin is secreted by the underlying mesoderm of the pharyngeal arches. Over time Noggin inhibits BMP7. Patched (Ptc) a secrete protein. Secreted in gradient fashion. Drives proliferation of endoderm cells. Bone Ossification Note: This series does not follow a timeline. 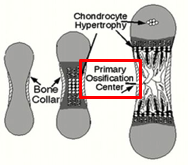 Endochondral ossification - cartilage model forms first then ossifies. Forms axial skeleton bones such as vertebrae, ribs, sternum, cranial base, and limbs. Long Bone Formation - occurs in layers or compartments due to Sclertomes, a type of somite progenitor cell. Epiphysis - Compartment of cartilage growth from progenitor cells. 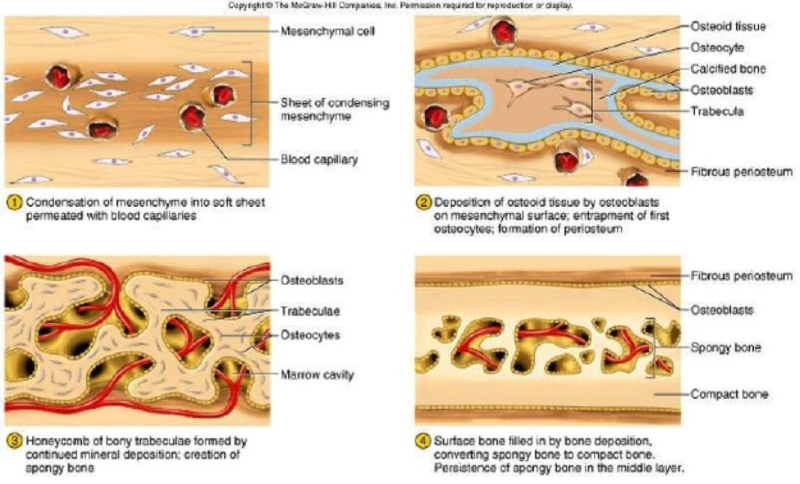 Consist of layers of resting chondrocytes. POC grows as the 2 epiphyses move in either direction by proliferating chondrocytes. 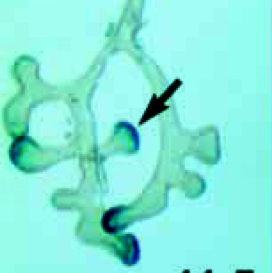 A bone collar forms around the diaphysis. At birth, there are growth plates (epiphyseal cartilage plates) between the epiphysis and proliferating chondrocytes of the diaphysis. Ossification of the growth plate happens in late teens. Hypertrophic Chondrocytes - Cells that are surrounded by calcified matrix and they secrete collagen. Eventually replaced by osteoblasts. 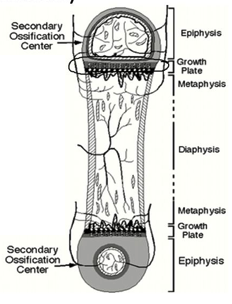 Intramembranous ossification - bone forms from mesenchyme or neural crest cells. Forms bones of the face and cranial vault. Spongy bone is filled in by continuous mineralization. 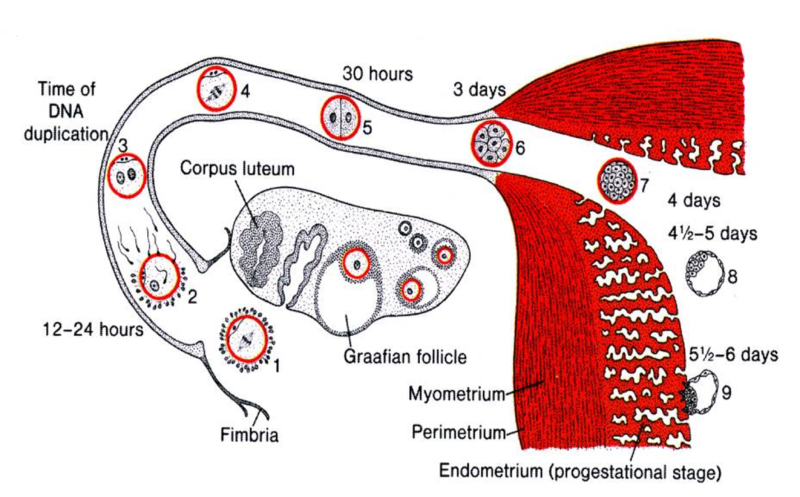 Blood islands start to develop in the definitive/secondary yolk sac in the extraembryonic mesoderm where there is low oxygen. 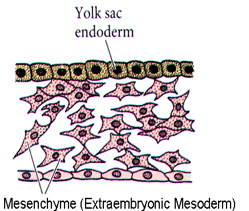 Extracellular matrix is around the endoderm of the secondary yolk sac. Vasculogenesis is the formation of the arteries and veins. 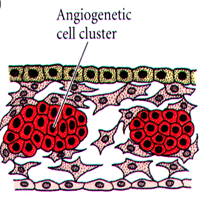 Angiogenesis is the branching of the existing ones. Mesenchyme cells begin to cluster (angiogenetic cell cluster) and differentiate into hemangioblasts. This is due to oxygen sensitive genes in the mesenchyme cell (HIF1-alpha). Low oxygen leads to increased HIF1-alpha expression which leads to VEGF mRNA production. It has autocrine and paracrine action. Further differentiation of the hemangioblasts produce both primitive blood cells from the cells inside the cluster (RBC are nucleated at this stage) and endothelial cells lining capillaries from cells on the periphery of the cluster. Bone marrow colonization. dHSCs migrate to the long bone marrow and become definitive hematopoietic stem cells. these cells give rise to multipotential (progentior) stem cells. They can become myeloid or lymphoid progenitor cells. wk10 Bone marrow development sites. Bone marrow is made in the bones at the places shaded in blue. Mesenchymal cells of the extraembryonic mesoderm express Flt1 (VEGF-R1) and Flk1 (VEGF-R2) that bind VEGF. When activated by VEGF they differentiate into the clusters. If the image is too small for you, you can click on it and it will blow up to full size as I uploaded it. Once the primitive streak regresses the cells left in the epiblast layer are the true ectoderm. Please Note: The information and pictures included in this "timeline" either came from Dr. Gallicano's (Georgetown University) lectures, primers, class notes, MINTS, and some "clarifying" information came from an reputable internet resource. Do not copy, or otherwise redistribute. 9/22/17 - Moved over Ectoderm Primer info - accidently put it on the wrong image last week. SORRY! "Epiblast cells that are to become mesodermal cells enter the space as mesenchymal cells, which is their cell TYPE, as opposed to be a cubodial or columnar type cell."